Copyright, Jewish Press of Pinellas County. Permission granted to University of Florida to digitize and display this item for non-profit research and educational purposes. Any reuse of this item in excess of fair use or other copyright exemptions requires permission of the copyright holder. PAGE 4 JEWISH PRESS of PINELLAS COUNTY MARCH 9 22, 2018 Macaroon & Candy Platter A CUSTOMER PASSOVER FAVORITE! Send our best-selling kosher assortment as a gift for Passover or any occasion. Makes a great hostess gift or the perfect addition to your own seder table. Serves 6-8. Hurry, while quantities last! SPECIAL OFFER! S ave over 20% and FREE Shipping Reg. $44.99 Now Only$34.99& FREE SHIPPING Save over 20% and FREE ShippingNow Only $34.99 (reg $44.99 ) and FREE ShippingCall 1-888-239-2545 or Visit ChallahConnection.com/welcome5Offer ends March 30, 2018 or until supplies last.Creating kvells since 2002 Norwalk, CT 06855 CERTIFIEDKOSHERfor Passover 6940 22nd Avenue North 727.345.7040 2220 4th Street North 727.822.2000 12670 Starkey Road, Largo Between Bryan Dairy and Ulmerton 727.518.8888OPEN 7 DAYS A WEEK LUNCH & DINNER SERVEDwww.atheniangardens.comFamily owned since 19776940 22nd Avenue North 727.345.7040 2220 4th Street North 727.822.2000 12670 Starkey Road, LargoBetween Bryan Dairy and Ulmerton727.518.8888 Where Everything is Homemade Where Everything is Homemade Lunch tab over $20Get $3 OffNot valid with other offers. Must present ad. Exp. 7/31/14 Dinner tab over $30Get $6 OffNot valid with other offers. Must present ad. Exp. 7/31/14 6940 22nd Avenue North 727.345.7040 2220 4th Street North 727.822.2000OPEN 7 DAYS A WEEK LUNCH & DINNER SERVEDwww.atheniangardens.comFamily owned since 19776940 22nd Avenue North 727.345.7040 2220 4th Street North 727.822.2000 Where Everything is Homemade Where Everything is Homemade Lunch tab over $30Get $4 OffNot valid with other offers. Must present ad. Dinner tab over $50Get $6 OffNot valid with other offers. Must present ad. Whether your kids like manatees or dinosaurs, are ready for a challenge or prefer ish Community Camp in Pinellas County planned. As in the camps inaugural summer, Homosassa State Park, the Museum of Scifed, mustering their courage on a high ers learn to ride horses and also offers hay Dinosaur World to dig for fossils, Tarpon Island. In addition to the regularly scheduled Pasco Counties and is housed in facilities at summer program that is open to all, and munitycamp.org.Jewish Community Camp will again go day tripping for fun and adventure offered in 2017. Temple Ahavat Shalom Palm HarborMens Night Out: Enjoy a night out with the Brotherhood at Mugs & Jugs, 40737 U.S. Hwy 19 N., Tarpon Springs on Tuesday, March 20 at 7 p.m. Lunch n learn: Congregant Susan Segal teaches a Torah study class on Thursdays from noon to 1:15 p.m. Bring a lunch, and of course, opinions. No prior knowledge or attendance is required. The class will use the book The Torah: A Womans Commentary. Misfortune and grief: An adult education class is underway on Tuesdays at 11 a.m. with Rabbi Gary Klein focusing on misfortune and grief. He will attempt to provide tools from the social sciences and from our Jewish tradition that will help us cope with our own suffering and help us assist others in dealing with theirs. He will use, as primary text the book, Option B, by Facebook (727) 785-8811 to join. Judaism basics: An Introduction to Judaism class is offered on Sundays at 10:30 a.m. This class, taught by Rabbi Klein, is appropriate for considering adopting Judaism as their faith, and those who are already Jewish who wish to enhance their knowledge of Judaism. New students are welcome anytime. Cost is $100 per person or couPoker tourney: The Brotherhood will sponsor the 2nd Annual Texas Hold em Poker Tournament on Saturday, April 7 at 7 p.m. The evening will include food, drinks and prizes for the winners. Buy-in is $40. For more informatoion or to RSVP, contact Scott Alalof at (904) 994-3820 or visit http://ahavatshalom.org/navigation-3/ brotherhood Toddler time: There will be an hour of activities incorporating music, literacy, Judaics and snacks for children ages 1-4 on Sunday, April 8 at 10 a.m. Tots are invited to bring a special adult with them. Temple Bnai Israel ClearwaterTrivia Night: Tickets are now on sale for Trivia Night on Saturday, April 21 at 5:30 p.m. The cost is $36 for adults and $18 for kids. Tickets include dinner and two drinks. Bible study: Explore the Second Book of Samuel and discover a unique period of Jewish history. Rabbi Daniel Treiser leads the classes on Wednesdays from 7-8 p.m. There is no fee for Sunday funday: Preschoolers and their parents can enjoy playtime on Sunday, March 18 from 10:30 a.m. to 12:30 p.m. when the children can meet one another and engage in fun activities. Non-members are welcome. Call the temple of(727) 531-5829. Adult playtime: Play mah jongg, Mexican Train Dominoes or Bridge on Thursdays at 1 p.m. Join active seniors and play the game of your choice. Coffee and cake is served. For more information, contact Linda White at linda33217@ gmail.com or (727) 688-0626.Cong. Beth Shalom ClearwaterCultural caravan: Gather in the synagogue parking lot on Sunday, March 25 at 12:30 p.m. to carpool to an Art in Bloom presentation at the Museum of Fine Arts in downtown St. Petersburg. Dont miss the chance to see this annual collaborainspire them. All are welcome. RSVP to Martha Margolis at (727) 409-5557. Book talk: A discussion of the book The Storyteller by Jodi Picault, a story about a baker and a Nazi, will be led by Roxanna Levin on Sunday, March 18 at 10:30 in the library. Tea time: The Sisterhood will hold its Torah Fund Tea on Sunday, March 18 at 1 p.m. Talmud classes: On Mondays and most Wednesdays, explore ancient legal tradition with Dr. Priscilla Nathanson The class is open to all levels of knowledge. The Monday class is held after minyan from 10 11:15 a.m. and the WednesLox & Learn: Led by Rabbi David Weizman, explore the weekly Torah portion every Thursday following minyan. Breakfast begins at 9:45 a.m. and the study session at 10 a.m. Haftarot study: This study will be led by Johanna Bromberg in the synagogue library on Wednesday, March 21 at 10 a.m. Meditation series: Rabbi Danielle Upbin, leads a course that combines guided meditation, meets next on Thursday, March 22 at 12:30 p.m. These sessions offer the Jewish tools to nurture self-growth and spiritual awareness. New parto RSVP. Shabbat Meditation Circle: Join Rabbi Upbin for a meditative Shabbat after Haftarah on Saturday, March 24 at 11 a.m. Torah study: Take part in an interactive conversation with Jason Palmer about the weekly Torah portion, incorporating both historical and contemporary reference material, on Saturday, March 24 at 12:30 p.m. Chabad of ClearwaterModel matzah bakery: Save the date for this annual program on Sunday, March 18 at 1 p.m. Torah and tea: Rebbetzin Miriam Hodakov leads a Torah and Tea exclusively for women on Wednesdays at 11:15 a.m. There is no charge to attend. RSVP to MiriamHodakov@ gmail.com or (727) 265-2770. Pray, eat, watch video: On Sundays from 9-10 a.m., feed your body and soul with a bagel short video presentation. There is no charge, and everyone is welcome. Study groups: Probe the ideas and issues presented in each weeks Torah portion on Mondays from 7-8 p.m. The Torah studies classes offer timely lessons for living. The class is free. Tanya class: A new weekly Tanya class, A Tale of Two Souls, meets on Saturdays from 10:15-11 a.m. The Tanya offers a roadmap for emotional healthy living. The in-depth study will ask such questions as What is a soul? What is our purpose here on earth? The class is free.Temple Beth-El St. PetersburgShabbat Wonder: A program designed to engage preschool age children and their families will be held on Sunday, March 18 at 9:30 a.m. This months program is a family-friendly celebration of Passover featuring songs, crafts and treats. RSVP to Molly Auld at mollyauld@gmail.com. Mah jongg: The Sisterhood is seeking mah jongg players and teachers. Games are held on Sundays from 10 a.m. to noon in the social hall. Those interested in a little healthy competition or learning a new game should contact Lisa Kingsley at purplegypsy10@yahoo.com or (727) 422-1663. Movie time: The Seniors for Arts, Growth and Education group will meet Monday, March 19 at 11 a.m. in the all-purpose room to watch West Bank Story. The movie captures the essence of the interpersonal relationships and challenges faced in Israel in a light-hearted, yet serious manner. There will be a discussion after the movie. Lunch will be $8 if you want it supplied, or you can bring your own for free. RSVP to Pamela Siskin at prsiskin@gmail.com.Chabad of St. PetersburgWomens Book Club: Chaya Korf leads a roundtable discussion every Tuesday from 10:3011:30 a.m., about the book for this year, Towards a Meaningful Life, by Simon Jacobson. The group wi ll share strategies for not only discovering where your true meaning lies, but also in actually making it a part of your daily life. Coffee, fruit and homemade pastries will be served at these free sessions. Walk-ins are welcome. This group will not meet on March 27 or April 3. RSVP to Chaya@ ChabadSP.com. PAGE 6 JEWISH PRESS of PINELLAS COUNTY MARCH 9 22, 2018 Congregations PINELLAS COUNTYReformTemple AHAVAT SHALOM 1575 Curlew Rd., Temple BETH CHAI DAVID Temple BETH-EL Congregation BNAI EMMUNAH 57 Read Temple BNAI ISRAEL ConservativeCongregation BETH SHALOM Congregation BETH SHOLOM Congregation BNAI ISRAEL OrthodoxCHABAD of CLEARWATER CHABAD JEWISH CENTER OF GREATER ST P ETERSBURG CHABAD of PINELLAS COUNTY Road, Palm Harbor, 34683 PASCO COUNTY ConservativeBETH TEFILLAH/JCC OF WEST PASCO OrthodoxCHABAD OF WEST P ASCO HERNANDO COUNTY Reform Temple BETH DAVID Religious Directory Rabbinically Speaking Rabbinically Speaking Shabbat Candle Lighting Times The Jewish tradition has its own calendar made up of 12 months that follow the lunar calendar. Every month has not only a unique name with a unique message attached to it but also a special energy that if we plug into it can provide us with the ability to achieve something special during the 30 days of the month. The Jewish month of Nissan, which falls out in the early spring around March and April, is a space in time, within which we enter as the access to a unique energy that allows for development and growth in the sphere of freedom. Freedom from both perceived or actual inhibitions, those that exist from within or without. Inhibitions which hold us back from personal growth, happiness and being the holiest Jew we can be, especially with the incessant news cycle and addiction to social media that overwhelm us. The month of Nissan provides us with a spiritualenergy boost to overcome them, to grow and climb higher and higher. As in the days of the Exodus when G-d redeemed the Jewish People with an outstretched arm, we have By RABBI YOSSI EBER Chabad of West PascoThe Jewish month of liberationthe ability to relive that by seeing ourselves as if G-d is personally taking us out of our personal enslavement and Egypt. By connecting to G-d, the creator and sustainer of all, the provider of our life and spirit within our hearts, we are able to experience true freedom. The liberation of being whole, by being one with our very essence, our creator and life itself. preparation for its climax on Passover, the 15th day of the month. At the seder when we gather with family, friends and strangers we reenact and simultaneously relive the freedom of our ancestors and as well as our own. As Jews we are all connected and are each considered a part of the whole body. Just as the health of one limb effects the rest of the body, so to if even one Jew is not celebrating the freedom we are incomplete. Therefore we have a responsibility to look out for each other, and that is one of the ways how we achieve our personal redemption. Have a Happy and Liberating Passover. The Rabbinically Speaking column is provided as a public service by the Jewish Press. Columns are assigned on a rotating basis by the Pinellas County Board of Rabbis. The views expressed in this guest column are those of the rabbi and do not necessarily the Board of Rabbis. PAGE 8 JEWISH PRESS of PINELLAS COUNTY MARCH 9 22, 2018 Authentic Middle Eastern Cuisine With a Modern Flair! 727.498.8627 MEZE119.COM 119 2nd Street North, St. PeteInvite us to your simcha, well bring the food! Our catering services can be customized to suit all of your needs.SUNDAY THURSDAY: 11 AM 9 PM FRIDAY SATURDAY: 11 AM 10 PMHeartfelt thanks from the Hershkowitz Family, for all of your ongoing support Serving Tampa Bays Best Kosher-Style Dairy Mediterranean-Inspired Cuisine. Nearly 80 were part of the action at Chabad of Clearwaters Purim in the Stadium. A baseball throwing speed cage, a basketball free throw competition and a visit from Tampa Bay Lightning Mascot ThunderBug kept young and old entertained. Photos by Douglas R. CliffordChabad of Clearwater Menachem Mendel Hodakov meets the Lightnings ThunderBug. Batya Amnony and Jayla Teshouva enjoy snow cones. Purim in picturesThe Hodakov team: Rabbi Levi and Rebbetzin Miriam Hodakov and their children.Photos by Hannah HartungChabad of Greater St. Petersburg (L-R) Adam Esquer and Rabbi Alter Korf The Sorkin family (L-R) Mitch, Richard and Liliana Rabbi Alter Korf reads the megillah at Freedom Square senior residence with the assistance of an animated version of the Book of Esther.Following the megillah reading and dinner, a Jews in Sports video was shown.Federation and Cong. Beth Tellah/ JCC of West Pasco celebrate Purim The Jewish Federation of Pinellas and Pasco Counties teamed up JCC of West Pasco in Port Richey for a Purim celebration on Sunday, March 4. With over 60 people in attendance, ranging in age from 1 years old to 90, the festivities included a bounce house, huge ga-ga ball pit, face painting, carnival games, and crafts. The congregation provided a costume boutique for those who needed help with their disguise. Lots of hamantashen were consumed. The event culminated in a traditional Purim costume parade and contest. Purim is the perfect holiday to reach out to members of our Pasco County community who may not know that the Federation is here for them. said Maxine Kaufman, Director of Arts and Culture at the Federation. Eileen Hochstadt, president of a success, proven by the miles of smiles on all the kinders faces as they bounced in the bouncy house, putted at the miniature golf game, dripped jelly on their creative Purim costumes from the delicious hamantaschen they gobbled down. Congregation President Eileen Hochstadt in costume. Winners of the costume contest Gauge Goldberg, Starla Goldberg and Isabella Cascone The Land family dressed up for PurimI am proud to have been part of this wonderful day. PAGE 12 JEWISH PRESS of PINELLAS COUNTY MARCH 9 22, 2018 THIS PAGE SPONSORED BY MENORAH MANOR JEWISH PRESS of PINELLAS COUNTY PAGE 9 FEBRUARY 23 MARCH 8, 2017 www.menorahmanor.org (727) 345-2775 Two Menorah Manor employees received the CNA and LPN Awards of Excellence at the Florida Association Directors of Nursing Administration (FADONA) 31st Annual Conference. The awards, which were presented during the organizations awards banquet at the Hilton Daytona Beach Oceanfront Resort on February 7, recognize certied nursing assistants (CNAs) and licensed practical nurses (LPNs) who demonstrate exceptional commitment to their profession and the residents they serve. Sadeta Kabilovic received 1st place for the CNA Award of Excellence, and Annette Jackson received 2nd place for the LPN Award of Excellence. Sadeta and Annette are dedicated and compassionate individuals who go above and beyond for our residents, said Rob Goldstein, chief executive ofcer of Menorah Manor. They are always striving to provide the best care possible, and it shows.Menorah Manor Wins Two Nursing Awards at Annual FADONA ConferenceOn Monday, February 19th, Menorah Manor donors and Trustees gathered together to celebrate the rededication of a beautiful donor recognition wall that is now located in the Toby Weinman Assisted Living Residence. Menorah Manor Chair Barry Kanner, whose parents lived in the Toby Weinman Assisted Living Residence, gave a heartfelt welcome at the gathering. I know rsthand that Toby Weinman is a truly special place where the residents are cared for and loved, and I couldnt be happier that this magnicent donor wall has landed here, he said. The gathering also included messages from Rob Goldstein, chief executive ofcer; Dell Krug, Menorah Manor former Board Chair; and guests of honor Beverly and Chip Weinman.Rob Goldstein, chief executive ofcer of Menorah Manor, speaks to donors and Trustees at the rededication gathering.Menorah Manor Celebrates Donor Wall Rededication (L-R) Beverly and Chip Weinman speak to donors and trustees at the rededication gathering. The Toby Weinman Assisted Living Residence is named in memory of Chip Weinmans mother, Toby. (L-R): Chief Executive Ofcer Rob Goldstein poses with award winners Sadeta Kabilovic and Annette Jackson during a celebration at Menorah Manor. WORDShe tossed out, 48 percent trust the Palestinian government more than the Israeli government, and 54 percent are not sure if Hamas is a terrorist organization. The hottest debate to sway minds for or against Israel or Palestine seems to be on college campuses, Luntz said. It is the job of all to stand up for Israel and for the older adults to teach Millennials the right words and phrases. The point is to use to engage ways to have a reasoned discussion and ultimately change hateful attitudes. Luntz used a power point presentation and urged all to take notes as he began with What Millennials Want to Hear: principal. street. national solution. and we both must learn to live together. social justice, equality and fairness. When pro-Palestinians speak on campus, there is a lot of shouting and hatred expressed, but Luntz said if you argue with them, you will not change their hearts. If you engage with them with respect and a willingness to listen to their views, they may return the respect and listen to yours, he said. He acknowledged that life is miserable for many Palestinians, many live in abject poverty and are taught hatred of Jews from an early age. But Luntz noted points of common ground, where pro-Israelis can agree that No child deserves to live like this. He advised to steer clear of religious/biblical arguments. Be the smartest voice in the room, not the loudest, Luntz said, adding that listening is often more important than speaking. He said folks should not argue over the problems, but look for solutions and ask rhetorical questions that bring people into a conversation. Using phrases like I hear you or I get it also foster better dialogue. Luntz also suggested people learn about their audience before they speak and cited examples of words or phrases that resonate more or less with people depending on party evokes more positive reactions from Republicans than Democrats and the phrase protect human rights resonates more with Democrats. cussion, not isolation and ignorance. effort, not hate and hysteria. tions from the audience and when asked about Israeli Prime Minister Benjamin Netahyahu, he predicted he will be re-elected, and indicted. He warned about the trend by Netanyahu and President Donald Trump to demonize the media and said the world needs a strong fourth estate. He also bemoaned the lack of tolerance in our society, saying it is growing worse, not better. The most important thing I can say to you is if we lose our tolerance, we lose our freedom. He said he is scared by the attacks on agreements are inevitable, but people need to return to speaking out with respect and decency. Given his history of conducting political polls, Luntz was asked about future election, he said in coming elections the two groups he will watch closely to see how they will vote are folks who make their livings by their hands folks who largely voted for group that largely shifted from Democrat to Republican in the last presidential election. He said that group loves the tax cuts and demeanor and tweets, so it will be interesting to see what sways them. man Douglas shootings are bringing us to a will happen this time. It may not be the change you want, though. PAGE 14 JEWISH PRESS of PINELLAS COUNTY MARCH 9 22, 2018 Israel Bonds honoreesPhoto by Peter Halmagyi At Israel Bonds annual International Prime Ministers Club Dinner in Miami Beach on Feb. 11, the Tampa Bay honorees were Rabbi Jacob Luski and his wife Joanne, of Congregation Bnai Israel in St. Petersburg. From left are Israel Bonds President and CEO Israel Maimon, Rabbi Luski, Joanne Luski, Finance Minister of Israel Moshe Kahlon and Israel Bonds Board Chairman Richard L. Hirsch. The Luskis were presented with the Israel70 award for their commitment and dedication to Israel and Jewish causes. They joined 18 others receiving the award, representing Dallas, Massachusetts, New Jersey, Miami, New Orleans, Cleveland, Boca Raton, Mexico City, Beverly Hills, CA; Chicago and Washington, D.C. Israel bond investments attributable to the dinner totaled $265 million.HEDY LAMARRONTINUED from FRONT PAGE and achievements alongside her frustrations and failures. The documentary, which screens March 22 as part of the Tampa Bay Jewish Film Festival, is most fascinating when it shifts from Lamarrs ambivalence toward Hollywood glamour to her wartime invention of a secure communication system. The beloved daughter of a Jewish banker, Hedy had a comfortable childhood before gravitating to the theater and movies. Fleeing a youthful marriage to a Jewish fascist who made arms for the Nazis, as well as the gathering storm in Europe, she purchased passage on an ocean liner. Aboard ship, she parlayed her bravado and striking good looks into an introduction to MGM executives and, eventually, studio mogul Louis B. Mayer in Los Angeles. in a very similar fashion, on a boat where he met someone from Samuel Goldwyns shop and ended up in Hollywood and it saved his life, Dean said in an interview last summer when Bombshell screened at the San Francisco Jewish Film Festival. He became a very powerful individual, and he did not like having been victimized by the Nazis and he kind of whitewashed that entire episode in his life. He didnt think of himself as a victim and he didnt want to think of his family or his tribe as victims, so being Jewish was a complicated thing for him. Dean, a journalist who produced newsmagazine segments for Bill Moyers and PBS and documentaries for Bloomberg as well as Businessweek magazine, saw in Lamarr a similar ground or circumstances. She also had the same kind of complicated relationship with being a woman, Dean asserts. She wanted to be Louis B. Mayer, she wanted to be Cecil B. DeMille. She didnt want to identify as a woman and she didnt want to identify as a Jew. Of course, it creates a schism in your psyche. It means your roots are cut off from you, and in some rootless. And what does that do to Support Our Advertisers!They help make the Jewish Press possible. Support Our Advertisers!They help make the Jewish Press possible. [ ]Support Our Advertisers!They help make the Jewish Press possible.Support Our Advertisers!They help make the Jewish Press possible. 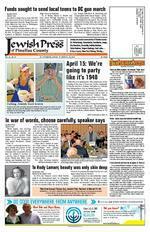 Support Our Advertisers!They help make the Jewish Press possible. you? I think if you dont understand her relationship with being Jewish you dont understand why she was such a broken person. Dean asserts that Lamarrs Jewishness was directly related to her development of a system for ships to communicate that the Nazis couldnt jam, an invention the Navy rejected during World War II but later proved valuable. The actress wasnt allowed to be open about her identity in her day job because Mayer believed that audiences wouldnt fantasize a base but key aspect of moviegoing about a Jew. At the same time, the Nazis were blowing up ships in the Atlantic with European Jewish children. Oh, and Lamarrs mother still needed to get to America. The mother converted to Catholicism in 1938 in Vienna, and Dean had assumed that her motivation was to make it easier to escape the Nazis. Then she discovered a letter that Hedy had written saying, Please do this for me, because I in Hollywood. The psychological effect of Lamarrs subterfuge mingled with her sorrow for the destruction calculate, but it subsequently manifested itself in the insistence to her children that she wasnt Jewish. In fact, Dean was compelled to confront Lamarrs offspring with their grandfathers death certificate, evidence of his burial in a Jewish cemetery and, of course, their grandmothers conversion papers. Deans greatest challenge in Bombshell was conveying Lamarrs many contradictions: strength and shallowness, altruism and cruelty, desire and despair. The unexpected yet utterly relevant in its portrayal of a woman stymied in her efforts to win respect on her terms. People are very quick to dislike Hedy Lamarr, Dean says. It appalled me, and made me extremely sad that people wouldnt give her any leeway to express herself. So I struggled to give her enough of a leash, in the way that she described herself and interacted with other people, that people would understand her and allow her to be a complicated person but still like her. Business Professional Directory& PAGE 16 JEWISH PRESS of PINELLAS COUNTY FEBRUARY 9 22, 2018Advertise in the JEWISH PRESSBusiness & Professional Directoryfor as little as $38 per issue. For more information, call 535-4400 CEMETERY LOTS WANTED: Adults with a desire to befriend a Jewish youngster. As a mentor/role model Community Services, (727) 450-7278. COMMUNITY SERVICES VOLUNTEER OPPORTUNITIESCOULD YOUR CHILD USE ANOTHER ADULT IN THEIR LIFE? Do you have children between the ages 6 who would at (727) 450-7278, for more information. CLASSIFIEDS ADS services and merchandise advertised, nor screens advertisers. All ads must be submitted in writing. $10 for 15 words, 10 each additional word. Residential Real Estate Inc.Ready to buy your condo on the beach or home in Pinellas County?Call: Marcy & Scott DanielsColdwell Banker Real Estate#1 Sales Team Clearwater & Clearwater Beach ofces www.marcydaniels.com727-560-8080 or 727-480-3515 Organizations 3 Home Visits $210 NOW $180.00 SAVINGS=$30! FL Lic.#43925 RELAX RECUPERATE REHABILITATE POSITION AVAILABLEJEWISH PRESS has OPENINGS for:SUMMER INTERNS include writing assignments and Karen Dawkins, managing editor PO Box 6970, Clearwater, FL 33758 email: jewishpress@aol.com. or call, (727) 535-4400 or (813) 871-2332. SERVICESR eadyEADY forFOR aA relationshiRELATIONSHI P? Know ACCOUNTANT SINGER CONSULTING: T woWO L awnAWN C ryRY P tsTS : Â Â HadassahMah jongg fundraiser: The Lylah Pinellas Chapter of Hadassah will have a fundraising mah jongg event on Wednesday, April 25 from 10 a.m. to 3 p.m. at Countryside Country Club, 3001 Countryside Blvd., Clearwater. The event will include a salad buffet luncheon and the cost is $25 per per son. To make arrangements for payment and to RSVP contact Â Lynne Brubaker at Â lynnebru@aol.com Â or (727) 782-3086. If you can, bring your card and your game. Meet the author: The North Pinellas Chapter of Hadassah will meet on Monday, March 19 at 11:30 a.m. at Temple Ahavat Shalom, 1575 Curlew Road, Palm Harbor, to hear author Marilyn Whelan, speak about her book, Caviar Living on Fish Stick Money. This book is a guide to home-spun lessons from a life well-lived. She will offer some ideas to help you stretch your money and enjoy life to the fullest. Bring your lunch. Drinks and desserts will be served. For more information, call Janice Caine at (727) 726-3735.Bnai BrithHorsing around fundraiser: Greater Tampa Bay Bnai Brith will be going to Tampa Bay Downs on Sunday, March 25 at 11 a.m. for its annual fundraiser. A full brunch will be offered from noon to 3 p.m. The cost is $50 per person and Â includes admission to the track, racing program, brunch and gratuities. Â RSVP to Arlene Berger immediately. For RSVP information, call Berger at (727) 726-9579.JWIFor the kids: Jewish Women Inter national North Pinellas will enjoy brunch as they hold a fundraiser for the Childrens Home on Sunday, April 22 at 10:30 a.m. with a Table for Two demonstration by Chef Warren Caterson. The event will be at East Lake Woodlands Country Club, with valet parking. The cost is $38 per person. Â For more information, contact Amy Richman at Â richman.amy52@gmail.com or (727) 543-0108.Genealogical SocietyMembers helping members: The Jewish Genealogical Society of Tampa Bay will meet on Sunday April 8 at 2 p.m. for a hands-on working session for individual research using the Internet and library resources of the society. Experienced society mentors will be on hand to provide guidance and assistance. Free access to Ancestry.com and to MyHeritage.com (Premium), will be available on several computers, which will be available for use. Attendees are asked to bring their own research materials and information and their own laptop computer if they have one. A pre-session social with refreshments and library access begins at 1:30 p.m. For information about the organization or directions to the meeting, call Bruce Hadburg at (727) 796-7981.Young Adults#Gather offers a mix of social and interac tive activities designed to help young adults connect. It is open to young adults of all faiths and backgrounds. For more information or to RSVP for any #Gather events, visit: www. bryanglazerfamilyjcc.com/gather or contact Lisa Robbins at lisa.robbins@jewishtampa. com or (813) 769-4723. Dinner and a movie: The #Gather group will meet on Thursday, March 22 at 6 p.m. for dinner at the Cask Social Kitchen, 208 S. Howard Ave., then travel to the Bryan Glazer Family JCC to watch Longing as part of the Tampa Bay Jewish Film Festival. In upended when a former college girlfriend tells him she had a son by him, and the teenage son just died. The cost is $10 for the movie and participants will pay their own cost for dinner. Job-LinksMonday Morning Links: Free sessions of Monday Morning Links are offered at the Jack Roth Center for Career Development at TampaBay-Job-Links, 4100 W. Kennedy Blvd., Suite 206, Tampa from 9:30 11 a.m. The March 19 topic is Linked-in From a Recruiter Perspective and the March 26 topic is Staying Motivated During Career Transition. Monday Morning Links is supported by the Vinik Family Foundation. Â Job-search aids: The next Success workshop will be April 1 from 9:30 a.m. to 12:30 p.m. The topic is Customize Your Resume for the Job You Want. Â The work shops are free for Â TampaBay Job-Links Â full pr ogram participants and $15 for guests. Reservations required for all programs. To RSVP, call (813) 344-0200, email Â RSVP@ TBJL.org. Â Special event: On March 22 from 9:30 a.m. to 2 p.m., photographer Allie Serrano for be on-hand for a photo shoot for job seekers. Â Support groupsAlzheimers caregiver group: Menorah Manor offers a support group meeting in the Samson Nursing Center at Menorah Manor, 255 59th St. N., St. Petersburg, on the Â For more information, call Gwen Kalden berg at (727) 302-3750. JEWISH PRESS of PINELLAS COUNTY PAGE 19 MARCH 9 22, 2018 of the plans and said he wanted members of his temple youth group to go. Although he and the temple youth director have prior commitments and cant accom pany teens from the temple, Rabbi Klein said Gamson graciously agreed that any teens from Ahavat Shalom could join the others for ing is secured. Gamson said the original deadline for signing up to go to the march was March 2 and that while she wants as many local Jewish teens as possible to make the trip, just to send the initial group of 30. The hope was to keep the personal cost to each teen at $300, but Gamfor any additional participants more funds are raised. Adding more people means more hotel rooms, more buses, but we are trying to make all of this work out, she said, noting that the original goal of $10,000 had to be doubled due to the higher estimat ed costs including continual rising airfares. I am going to empty my discretionary fund and I already this morning got a $500 commitment from our Social Action Committee to help send our kids to Washington and I plan to make an appeal for funds during services tonight and to send an email to our congregants to help our kids get to the march, Rabbi Klein said. He also plans to encourage those who could not attend the Washington march to join local March for Our Lives events in Tampa or St. Petersburg. I cannot go to Washington with our kids, but I will be at one or the other of the local marches, the rabbi said. The local marches The Tampa March for Our Lives will be at Kiley Garden/Curtis Hixon Park, 400 N. Ashley Drive, in downtown Tampa at 10 a.m. on Saturday, March 24, and the one in St. Petersburg will be at the same time in front of the Pinellas County Courthouse at Sixth Street North and Mirror Lake Drive. Hopefully with our teens behind this effort, we will see progress made in creating a safer society through the reduction in the number and type of guns that are allowed to be owned, Rabbi Klein said. At Congregation Schaarai Zedek in Tampa the youth group decided rather than try to get to Washington, they would go to the Tampa March for Our Lives event. Rabbi Richard Birnholz at Schaarai Zedek said he expects between 25 to 50 members of the youth group to attend the Tampa march and other members would be going to Parkland for a March for Our Lives there. We will try to draw our own legislators attention here, Rabbi Birnholz said, adding that the idea was that the teens could make more of a show of support for gun violence prevention at less of a cost. One of the Tampa march organizers, Brooke Shapiro, is a mem ber of Schaarai Zedek. When the shooting occurred in Parkland, I felt a personal connection because I was born in Coral Springs and if I had not moved to Tampa, I would have been district ed to Marjory Stoneman Douglas, said Shapiro, a senior at Plant High. My childhood friends were at the school that day and thankwith the victims they could have been my sister, my friends, my teachers, or me. I couldnt just return to school the next day and pretend nothing had happened. When the Stoneman Douglas students began organizing the national march and called for sister marches, Shapiro saw that as her cue to organize a march in Tampa. The march is necessary because we need to keep the momentum and the conversation going. We are scared to sit in our classrooms. Students want a future and we want to have a say in that future. Shapiro said she is hoping to have a student from Stoneman Douglas speak at the Tampa march during a rally at 10 a.m. before the march in downtown Tampa beginning at 11 a.m. For more information about either local march, visit their Facebook page. Other inspiration to march The impetus for sending teens to the national march was a trip that 50 Reform Jewish teens from the Tampa Bay area made to Washington last month as part of the Religious Action Centers LTaken Social Justice program. On Feb. 12 two days before the Parkland shootings the teens lobbied Congressional representatives and staff members to support legisla tion that was important to them: immigration reform, LGBTQ+ equality, climate change, womens reproductive rights and gun violence prevention. Gamson said some of those same teens came to her after the shootings and after hearing about the national march, saying they wanted to return to Washington. The Parkland slayings deeply impacted many local teens because they knew teens from Parkland through NFTY (North American Federation of Temple Youth) activities or shared experiences at Camp Coleman, a Reform movement Jewish summer camp in north Georgia, said Lisa Cohen, youth director at Beth Am. Rachel Buksbaum of Beth Am met and quickly became friends with Alyssa Alhadeff, one of the slain teens, at Camp Coleman. How to donate Donations to send the Bay Area teens to Washington can be made by going to GoFundMe.com and searching for March for Our Lives Tampa Bay. In addition, tax deductible donations (with a clear note designating the donation is for the march) can be made to: Temple Bnai Israel, c/o March for Our Lives Donation, 1685 S. Belcher Road, Clearwater, FL 33764, or by calling the temple at (727) 531-5829. In Tampa donations can be made to Congregation Beth Am, c/o March for our Lives Donation, 2030 W. Fletcher Ave., Tampa, FL 33612, or by calling (813) 968-8511. Temple Beth-El has not for mally set up a donation system, but Gamson said those who want to donate through that synagogue should contact Rabbi Michael Torop at (727) 347-6136. The effort to raise funds to support the Temple Ahavat Shalom teens did not materialize until March 9, so those wishing to support those teens should contact that temple at (727) 785-8811. Calls were made to several local Conservative congregations in the area to see if their youth groups had formally organized MARCHCONTINUED from FRONT PAGE $370* rf rr f Savings amounts are averages based on information from The Hartfords AARP Auto Insurance Program customers who became new policyholders between 1/1/16 and 12/31/16 and provided data regarding their savings and prior carrier. Your savings may vary. AARP and its af liates are not insurers. Paid endorsement. The Hartford pays royalty fees to AARP for the use of its intellectual property. These fees are used for the general purposes of AARP. AARP membership is required for Program eligibility in most states. The AARP Automobile Insurance Program from The Hartford is underwritten by Hartford Fire Insurance Company and its af liates, One Hartford Plaza, Hartford, CT 06155. Auto program is currently unavailable in Massachusetts, Canada and U.S. Territories or possessions. Speci c features, credits and discounts may vary and may not be available in all states in accordance with state lings and applicable law. Applicants are individually underwritten and some may not qualify.nnftb fbtn ntrrntbbbbbnbbbttbb bbtbb n tbnbtbn bn bb to make the trip to Washington. One indicated no plans and two were not available for comment. Dana Shepard at Congregation Beth Shalom in Clearwater said the national United Synagogues of Conservative Judaism supports the national march and is raising funds to help house and feed kids going to the march. She added that that at least one Conservative synagogue in Washington will allow people going to the march to sleep there. (A major Reform synagogue in Washington has made a similar offer.) Shepard said she recently sent an email to her youth group members to gauge their interest in the march but had not received responses yet. Brooke Shapiro, a member of Congregation Schaarai Zedek, is one of the organizers of the Tampa March for Our Lives.